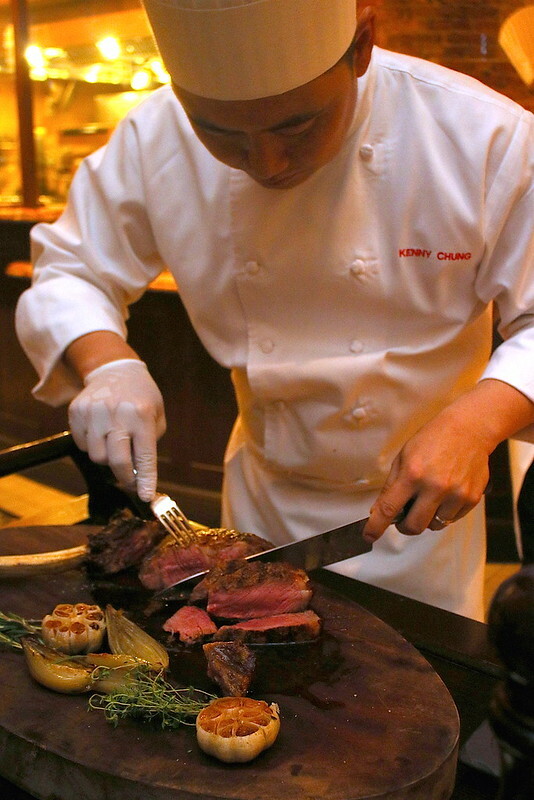 We all know about the iconic Long Bar at Raffles Hotel, but did you know there is a Long Bar Steakhouse as well? It was only recently that I had heard about it. The steakhouse is on the level 2 of Raffles Hotel Arcade quietly tucked around the corner next to the Long Bar. 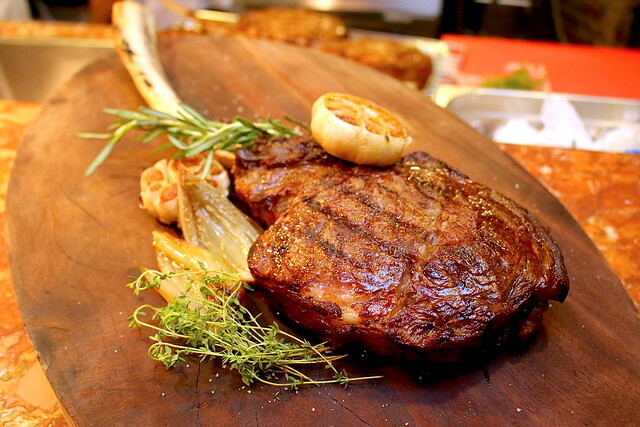 Well, now there's extra reason to visit soon because they are bringing in premium tomahawk steaks for a short time. Resident steak expert Chef de Cuisine, Kenny Chung, is showing us the 1.7 kg on-the-bone ribeye steak which is two inches thick. Air-flown from Australia, the grain-fed tomahawk has higher marbling than its grass-fed counterpart. This steak was designed to melt in the mouth. While the steak was cooking, we were treated to the steakhouse's sampler, featuring perfectly grilled scallops, smoked salmon, and Dungeness crab in a delicious crabcake. 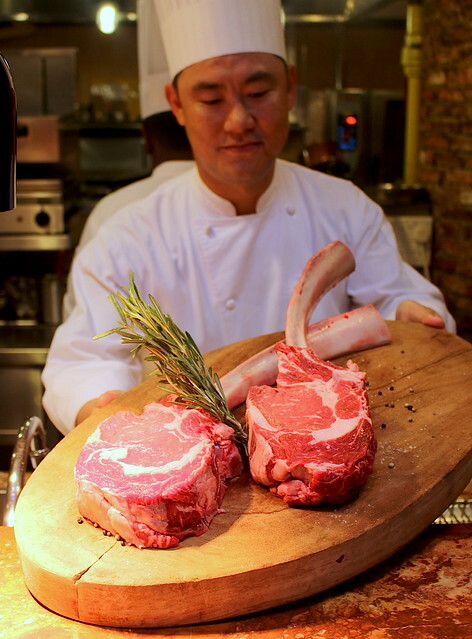 Chef Kenny simply seasons the tomahawk with salt and pepper. With such a good cut of meat, you need little else. He puts it on the grill for five minutes on each side. Next, he places it into a convection oven before finishing it in a pizza oven so it forms a perfect outer crust while retaining a juicy centre. Here he is slicing it, as we wait with bated breath. It looks so good! 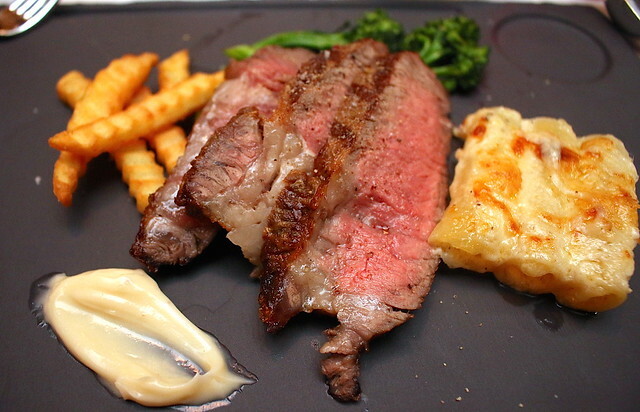 The sizeable steak is perfect for two to three diners. Chef Kenny is wonderful to listen to, because he has this unmistakable French accent (he's Chinese but from Mauritius). Wow, I haven't had a steak this good in I can't remember how long. I love the lightly salted crust and juicy tender medium-rare meat. Pair this with some of Long Bar Steakhouse’s side dishes like the Mac and Cheese, Sautéed Broccolini and French Fries with Truffle Salt. 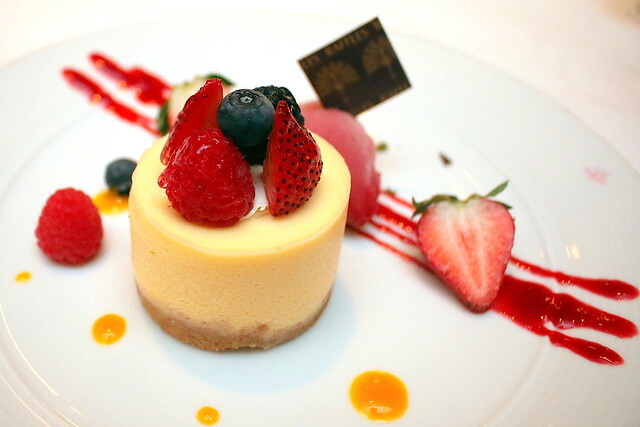 You have to finish off the meal with the Cheesecake. This one is seriously addictive with the right dense texture melting into potent flavours on your tongue. I asked how long it would run...well, until stocks lasts! I think they ordered enough for a month, but it really depends on how fast they run out! So don't wait too long! Many thanks to Raffles Hotel for the invitation and amazing first experience of Long Bar Steakhouse!